Ever since I was a kid and played Fatal Fury 1 I have been a big fan of the FF series of games. I actually thought that Real Bout Fatal Fury 2 would be the last one that we would see on the Neo Geo (especially after they went on and made the rather lousy 3D "Wild Ambition" game for the Neo Geo 64 and PSX). Thankfully I was wrong however and Fatal Fury has returned in 2D with a totally new look and is better than it has ever been! It is refreshing to see that the developers didn't just say "Hey, lets throw together a game with some new backgrounds, the same fighters as the last game and maybe one or two new ones. Then we'll add a few new moves and call it Real Bout Fatal Fury 4!" Instead, they had the confidence to throw the old established character roster out of the window and bought in an almost completely new one. I think the game is actually set a few years after the last one. This means that there is no Andy Bogard, no Joe Higashi, no Blue Mary and worse still... No Mai Shiranui! I can remember looking at the previews of this game and I thought it looked pretty incredible, but it is fair to say that I was unsure about this selection. The only remaining character is Terry Bogard and even he looks very different. Gone are the famous cap and red coat, he now sports a brown leather jacket and plain shoulder length hair... It really does look strange to see him fight without the hat! For the most part, his moves are still the same with a few additions, although some things are removed (like his rising tackle). If you haven't played Garou yet, I'm guessing that like me you might have been disappointed that no other Fatal Fury people remain. Well, I said the same thing, and then I played the game! Once you get into it, believe me when I say this games character selection is extremely good. The new fighters are: Rock Howard (son of Geese! 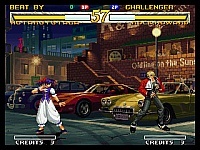 ), Kim Dong Hwan and Kim Jae Hoon (sons of Kim Kap Hwan from the other Fatal Fury games), Hotaru Futaba (the purple haired girl in the screenshot above), Gato (pretty cool new fighter), Bonne Jenet (a pirate from England, looks a little like Blue Mary), Marco Rodriguez (uses Kyokugen Karate as he is a student of Ryo from AOF series! ), Hokutomaru (really funny kid! ), Freeman (who seems to be somewhat mad� he is also from my home country England, so that probably explains it! ), The Griffon (A wrestler), Kevin Rian (Swat team member) and finally the two bosses: Grant and Kain (who are both are playable after entering a code). I was expecting these new characters to be updated versions of old characters like in the change from Tekken 2 to Tekken 3, where for example Martial Law changed to Forest Law, but played in more or less the same fashion. Some moves and fighters ARE similar to the old ones, but mostly they're original. 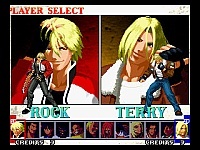 The best of the new selection in my opinion are Rock Howard who is very cool, Hokutomaru who always makes me laugh when I see his winning poses and also Freeman because its nice to see a fighter from my home country, even if he is a little... freaky! To be fair though, all of them are very good and I found it easy to pick up and play the game with any character. SNK have added a totally new feature called T.O.P (Tactical Offensive Position) to Garou. At the start of each match, you can adjust which point of your life bar you would like T.O.P to be enabled at (from a choice of three positions). When your energy bar is within this area during a fight, there are a few advantages. You get the ability to perform a T.O.P move (press C+D together), your attack power goes up and your life bar will also slowly replenish. This is a cool idea in my opinion. Another thing SNK has done with this game is to simplify many of the super moves. For almost every character, to perform a super move (when your gauge reaches "S Power") its just Half Circle Forward X2 and A or B. For the Potential power moves (when the gauge reaches "P Power") which are basically souped up versions of the "S" Power moves, you do Half Circle Forward X2 and C or D. There are a few exceptions, but generally it's the same for everyone. This does make it easier to get to grips with each character, although I am sure some people may think this is a little cheap. One thing is for sure though; these moves look excellent! The graphics in this game are some of the most impressive ever on this system and really must be pushing it as far as it can go. OK, OK... I know that I have said that about a few Neo games before. Just take a look at my reviews of The Last Blade and KOF '99 for instance. It continually amazes me that developers seem to keep squeezing the Neo Geo for EVERY last bit of power that they can! I thought KOF '99 looked excellent for a ten-year-old machine, but this game betters it somehow. Each stage looks very good, with some great effects in places, such as the waterfalls on Gato's stage, the many hidden details on Hokutomaru's stage (like Last Blade characters sitting in some of the cars and signposts featuring Mai Shiranui and Andy Bogard) and also the birds flying around on Hotaru's stage. Be sure to check out boss Kains stage too (see screenshot) I thought it looked very cool. They change between rounds as well. For instance in the first round when you fight against Terry you are on a moving train, but by the second round it has stopped at a station... Wait for a few seconds and the trains here begin to pull out of the station. They have their own little intro screen before the fight too (like the ones in Last Blade), which I like. It doesn't stop there either, as every other part of this game is extremely well polished. The characters look great and the animation is just sublime (there are too many little details EVERYWHERE to mention here). Admittedly there is more room on this game for frames of animation than there is in KOF, because the character roster is much smaller than in that game. The style of graphics reminds me of Art of Fighting 3 (obviously even more so when you play as Kyokugen Karate guy Marco!). There is also some fantastic artwork. There are two introduction sequences that play at random, one is quite short, but the other is longer and looks great. It actually made me laugh when I first saw it, because it looks and sounds like the intro to a seventies TV show (Check out that funky music on the MP3 below!). But if you think the artwork there is cool, then wait till you see some of the endings, which are REALLY, REALLY great. At the time of writing I have not seen them all, but I was very impressed. Again, I have said it before, but I can't imagine the presentation and graphics looking any better. Maybe SNK will prove me wrong again on some future game; I certainly hope so! Unfortunately the soundtrack isn't quite up to the same standard. I'm not saying its rubbish, in fact some of it is exceptionally good, but certain parts could be better in my opinion. The music ranges from absolutely great (Rock Howards stage), to good (Hotaru's stage), to not quite so good - like the intro music I mentioned earlier or Bonne Jenets stage. That sounds like a weird remix of Terrys old train stage music from previous FF games and Blue Marys stage music from RBFF2 mixed together. Even these don't sound truly awful, its just that I think the soundtrack was better overall in Real Bout Fatal Fury Special and Real Bout 2 , although Garou's music does grow on you after a while. One thing that I found very interesting was Rock Howards music; about 50 seconds into it, it sounds exactly and I do mean exactly like "Children" by Robert Miles. Check out the MP3 file below to see what I mean! I guess one of SNK's composers likes Robert Miles! Whatever the reason, I like the music on that stage a lot, its just a pity that all of them don't sound as good. The effects and speech are all very good though, so I have no complaints in that area whatsoever. A small snippet which sounds a lot like Robert Miles "Children". So... was it worth SNK making an 8th (or 9th if you count Wild Ambition) Fatal Fury game? In a nutshell, yes definitely! 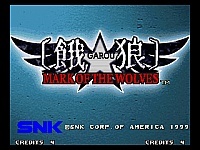 Garou: Mark of the Wolves is very easily on the same par as other great Neo Geo Fighters like The Last Blade, Samurai Shodown and The King of Fighters, as well as the previous Fatal Fury games. While many would say that the KOF series has outstayed its welcome (although I don't share that opinion), with each new version not offering anything sufficiently new, Garou is different to previous games in the series. The controls are great and I'm sure a lot of people might be happy that the super moves are easier to perform. The fights really do move at a very fast pace too, especially with a faster fighter like Hotaru for instance. I have been addicted to this game since I first played it and I think that I am going to stay addicted for a long time to come. I did notice that it is a little easier to complete than RBFF2, but maybe that is just because I am really good at it (yeah, right!). It's also worth noting that this game no longer features the two/three tiered fight arenas(being able to dodge up and down) like all the other Fatal Fury games. Whether you think that is a good or bad thing is all down to personal taste, but it doesn't bother me personally. This is without one of the best fighters available on this system, and definitely one of the most popular and most talked about SNK games ever. It's a must play, and hopefully we will eventually see a sequel to it, even if it won't be a Neo Geo game. 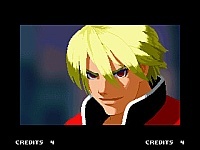 I wouldn't say G:MotW is as good as Real Bout Fatal Fury Special or RB2: The Newcomers, but it is still a great game.